WelCom November 2017: In June this year, Cardinal John Dew and Bishop Mark Whitfield of the Lutheran Church of New Zealand led an ecumenical service at Sacred Heart Cathedral attended by Catholic, Lutherans and several other Christian denominations, formally opening the New Zealand dialogue between the Catholic and Lutheran Churches. On Sunday, 29 October, Cardinal John Dew and Bishop Mark Whitfield officially signed the statement below, following a service at St Paul’s Anglican Cathedral in Wellington marking 31 October as the 500th year anniversary of the Reformation. In the town of Wittenberg, Germany, on 31 October 1517, Martin Luther posted 95 theses concerning failings he saw in the Church. He meant them for debate but they sparked controversy and turmoil that spilled over into a reshaping of the religious and cultural history of Western Christianity. The date and the event have become symbolic of the beginning of the Protestant Reformation. Five hundred years on, even though both the church and the world are very different from the time of Martin Luther, the effects of the Reformation endure. This major anniversary cannot go unnoticed or without reflection. While deeply aware of the past and of the hurt resulting from division, we are very grateful to God for the healing that has happened in recent decades between Catholics and Lutherans and for the impetus to unity that we share. We look forward to walking a common path in the future, witnessing together to the mercy of God in proclamation and service to the world. Animosity towards each other, and the conviction that the other was unfaithful to the gospel of Jesus Christ caused untold harm between individuals, families and whole nations. This damage to gospel witness and personal dignity cries out for recognition and this we certainly and humbly acknowledge. We rely on a merciful God who has not abandoned his church, and we open our heart to the Holy Spirit who heals broken memories. By the grace of God there has been a fresh impetus towards unity during the past half century. The Second Vatican Council (1962-65) not only opened the way for Catholic participation in ecumenical dialogue, but also provided a pathway for renewal. Lutherans across the world responded positively and Catholics and Lutherans have now been engaged internationally in theological dialogue for 50 years. The most important step was the signing of the Joint Declaration on the Doctrine of Justification by the Roman Catholic Church and the Lutheran World Federation in 1999. This document was also signed by representatives of the Catholic and Lutheran churches in New Zealand. 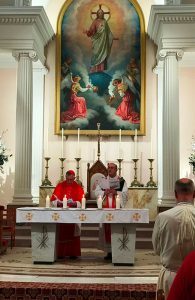 On 4 June 2017, the 500th anniversary was commemorated in Wellington’s Sacred Heart Cathedral. Cardinal John Dew (Catholic) and Bishop Mark Whitfield (Lutheran) led an ecumenical worship service during which Catholics and Lutherans, in the presence of Christians from several denominations, formally opened the Aotearoa-New Zealand Dialogue. This Statement, based on one recently issued in Australia is the first from this local initiative. In Australia, a Roman Catholic-Lutheran Dialogue team has been earnestly discussing ongoing issues for the past 30 years. The Lutheran Church of New Zealand, as a District of the Lutheran Church of Australia, has been a party to this discussion. The Lutheran and Catholic representatives on the New Zealand Dialogue Commission are now committed to studying the documents of the Australian Dialogue, and presenting the pastoral and theological fruit of the discussion to the Catholic and Lutheran churches in New Zealand. For many, the issues that led to division in the 16th century seem remote from the concerns of 21st century people. Yet, when we sift through the many words written at that time, we discover a simple desire on both sides for people to come to know the justice and mercy of God and experience them in their lives. Seen in this light, the concerns of 500 years ago are not as remote as they may have seemed at first sight, even if their presentation is different. The question the Church faces in every age is how to communicate the truth about God. The anniversary of the Reformation prompts us to reflect together on this question, requiring a new commitment to teach and preach God’s Word. This, in turn, will require a re-statement about the saving love of God revealed in Jesus Christ through the Holy Spirit and fresh imagining about how to speak of God to our own extremely diverse society. We therefore commit ourselves to that on-going renewal that will take us to the heart of the gospel of Jesus Christ, to know and appreciate its power and relevance for our times. As living stones (cf 1 Peter 2:5), chosen for the building of God’s house, we have not always cooperated with the Builder. Now we must take hold of the opportunity given us by the Holy Spirit, and with generosity of heart and deep compassion set ourselves to be built into a spiritual house for the glory of God and the good of our world. Unity is indeed the gift of God and the will of Christ in whom all things hold together (cf Colossians 1:17). We gratefully acknowledge the unity we already share. Together we confess one faith, one Lord, one baptism. We encourage all members of our two communities, Roman Catholic and Lutheran, to hear God’s call for continued transformation, meeting together whenever possible and witnessing the joy and power of the gospel in daily life.